On February 23rd we attended an evening event at the Wahkeena Nature Preserve in Fairfield County. 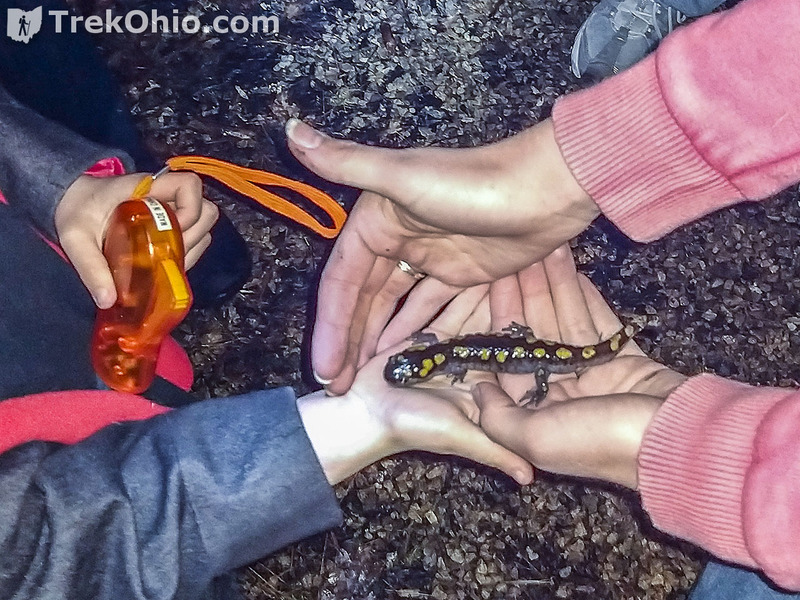 The event was being held so that participants could view salamander’s migrating to their vernal pools at Wahkeena. When the event was announced, the weather forecast called for rain that evening. However, despite some rain earlier in the day, it did not rain at all during the evening. Originally I thought that we had been lucky weather-wise, but then I learned that the staff had been trying to schedule the event during the rain because these particular amphibians are much more comfortable moving overland while it is raining. So the lack of rain during our viewing period probably reduced the number of salamanders that chose to make the trip then. During that evening, we had an opportunity to view three amphibian species. The breeding amphibian species were the spotted salamander, the red-spotted newt, and the wood frog. 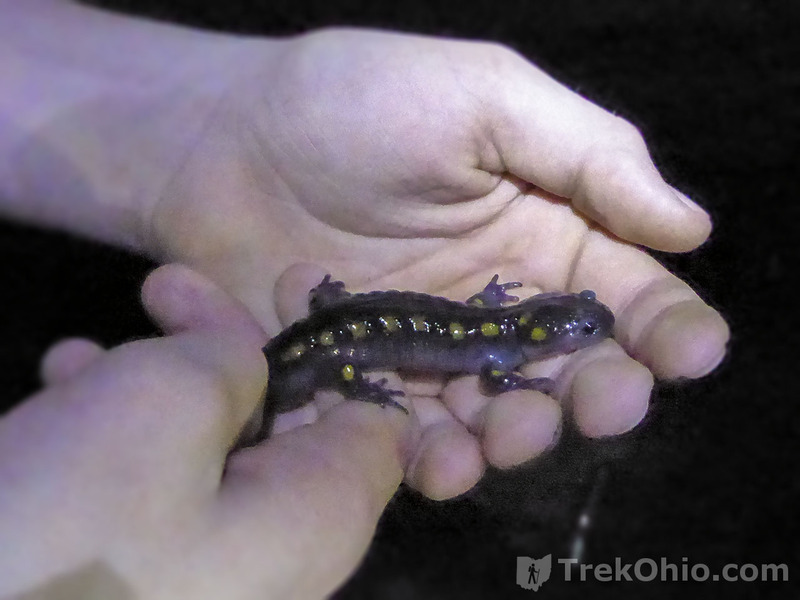 We have seen a number of different amphibians while hiking, but we have never seen a spotted salamander. It turns out there is a very good reason for that. During the winter, these salamanders hibernate underground. When they wake up in late winter, they migrate to vernal pools, typically the same pools where they themselves were born. 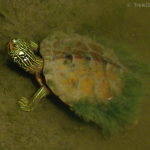 After breeding they spend the day living underground, or beneath leaf litter, rocks and logs. On wet nights they venture to the surface of the forest floor in search of food. Their diet consists of worms, spiders, insects, and slugs. During the program at Wahkeena several salamanders were picked up before they could reach their intended vernal pool. Some were placed in boxes where they could be examined or touched, while guests were allowed to carefully hold others. In order to hold a salamander without damaging their sensitive skin, it was important that people had not used products on their hands such a Purell™, perfumes, or insecticides and also that the person first wet their hands. 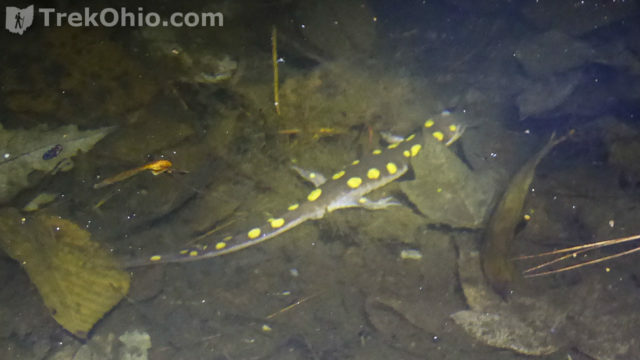 The spotted salamanders range in length from 5.9 to 9.8 inches. 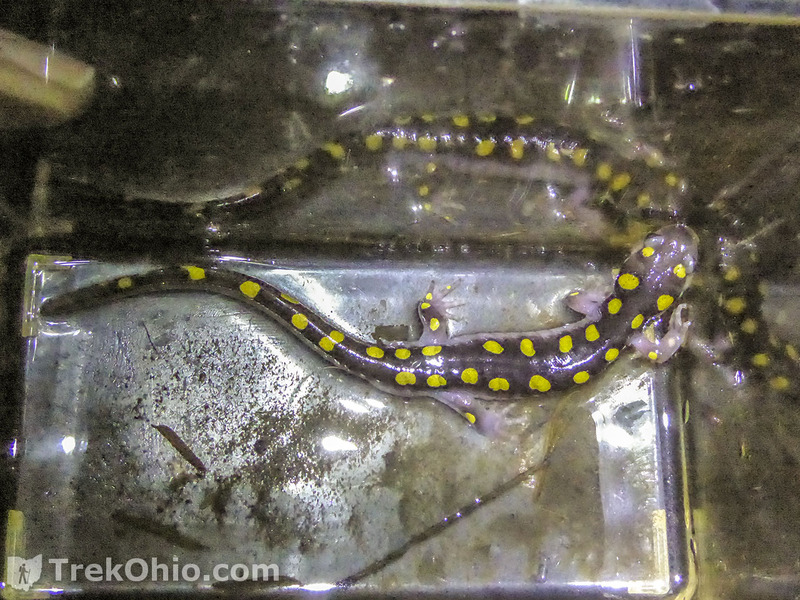 Once those who were interested had examined the salamander it was released, so it could enter its vernal pool. In the salamander above, you can see a slight swelling on the animal’s bottom behind its rear legs. This indicates that this is a male salamander. After breeding the swollen area will subside. All of the salamanders that we observed were males. They typically arrive at the vernal pool first. Their sexual organs excrete packets of sperm called spermatophores which they attach to objects that are resting on the pool’s bottom, such as sunken twigs and sticks. When the females arrive, courtship involves the male trying to induce the female to pick up his spermatophores with her cloaca (the opening from which eggs will later be laid). On another occasion at Wahkeena, I had an opportunity to photograph the left-over spermatophores of the spotted salamander that hadn’t been used to fertilize eggs. They look like white blobs. You can see how they are attached to underwater sticks. Leftover spermatophores produced by the male spotted salamander (Ambystoma maculatum). The spermatophores which are selected by the female fertilize the eggs within her body. After this happens she releases all of her fertilized eggs as a group encased within a single, jelly packet which the female also attaches to an underwater stick. There is a material within the jelly that rapidly absorbs water after the egg packet is released into the pool. This jelly helps to keep the fertilized eggs nice and moist. Since there is one, large mass of jelly, this also means that the eggs can’t be picked off one at a time by small predators. Surprisingly the jelly is so impervious that oxygen can’t penetrate the casing. However, there is a species of algae that lives within the jelly called Oophila amblystomatis that generates oxygen via photosynthesis that the developing eggs need. 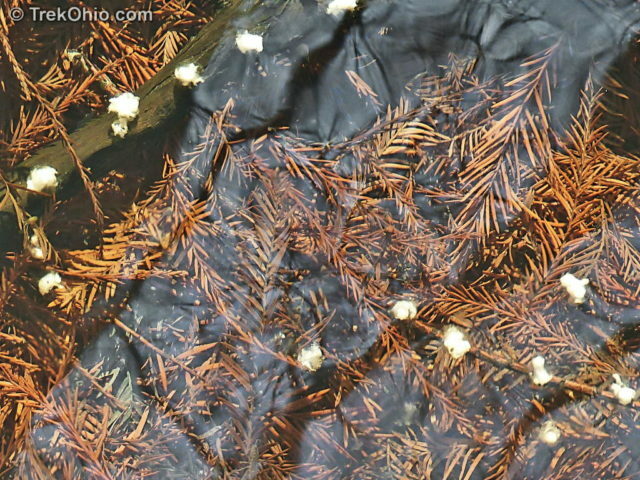 These are the eggs of a spotted salamander encased in a single, jelly-like mass that has been attached to an underwater stick. 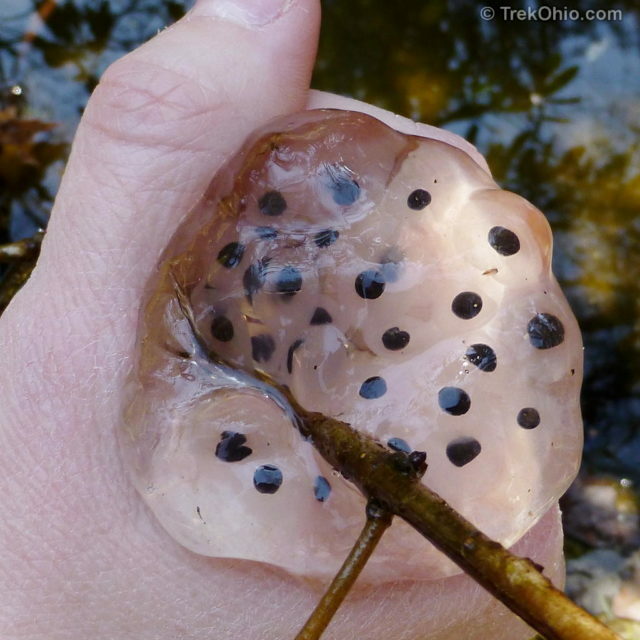 The spotted salamander eggs develop into the larval form of the species which is analogous to the the tadpole stage seen in frogs and toads. 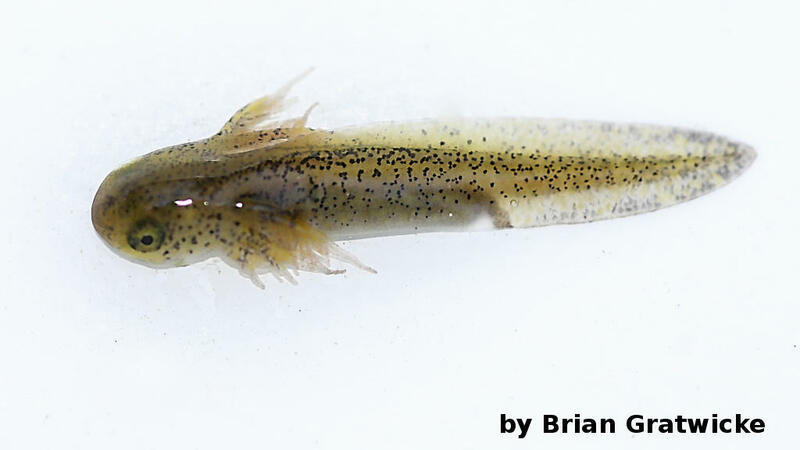 Salamander larvae have feathery, external gills and live an exclusively aquatic life. 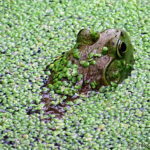 Even with all the advantages of developing in a vernal pool, only about ten percent of the fertilized eggs will develop into mature adults. The young adults walk off into the forest where they will live for several years until they, too, reach sexual maturity and the cycle repeats itself. Spotted salamanders have been known to live up to 32 years. Newts and salamanders are similar in that both are amphibians which start out life with gills in the water and then take on a somewhat lizard-like appearance when they reach adulthood. One big difference is that salamanders typically pass through two phases of life after emerging from their eggs: an aquatic, larval form, and a terrestrial, adult form. However, the red-spotted newt goes through three stages. Like the salamander, it starts out as an aquatic larva. Then it loses its gills, acquires legs and becomes a terrestrial red eft. It usually lives as a red eft for the next three to seven years (although surprisingly some newts skip this stage and go directly to the next stage). Following the red-eft stage, it transforms once again to become an aquatic adult. 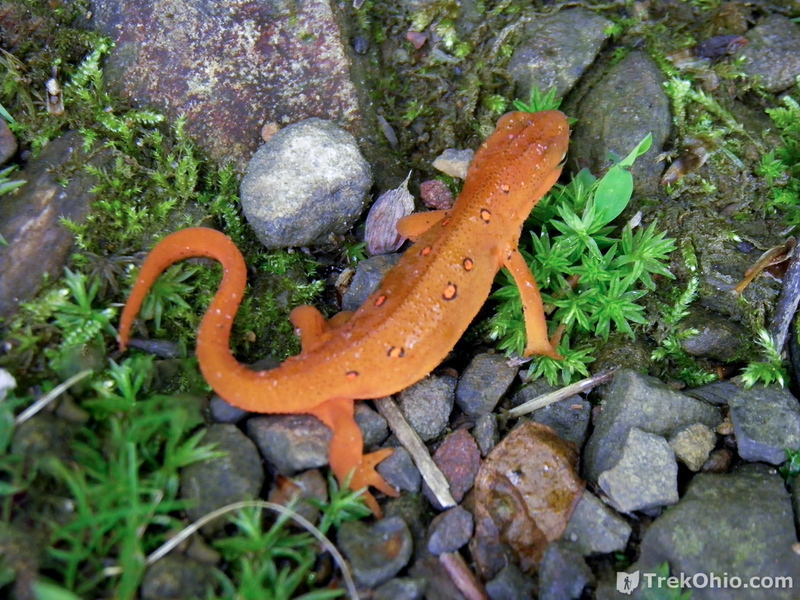 Unlike the spotted salamander, the red eft may travel a considerable distance from the water where it was born. When it transforms into its final, aquatic form, it chooses a new body of water where it will usually spend the rest of its life. This behavior allows the species to disperse to a greater extent than the spotted salamander. The bright, red color is meant to warn potential predators that it produces a poisonous toxin that may kill them if they eat it. 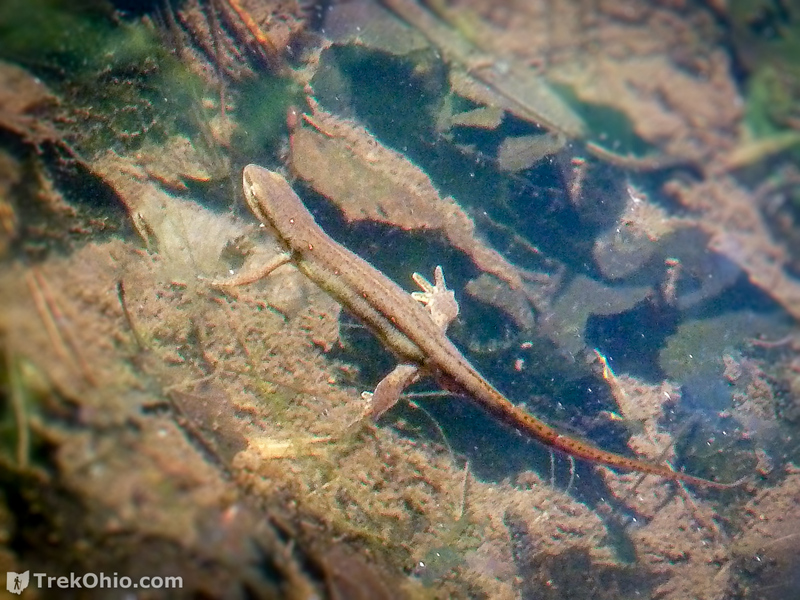 In the adult, aquatic form, the newt lives in the water but keeps the lungs that it has developed while an eft rather than reverting back to having gills. Nonetheless the aquatic adult can be spotted out of the water on occasion. In the event of severe droughts, the aquatic, adult newts have been known to once again revert to their terrestrial, red eft form to survive the drought and possibly to find a new body of water in which to live. Below is an adult, aquatic newt swimming in its pool. Below is a red-spotted newt that was captured near the water at Wahkeena at the same time that we were capturing salamanders. You can see that they are considerably smaller than the spotted salamander. A red-spotted newt that was captured near a vernal pond. 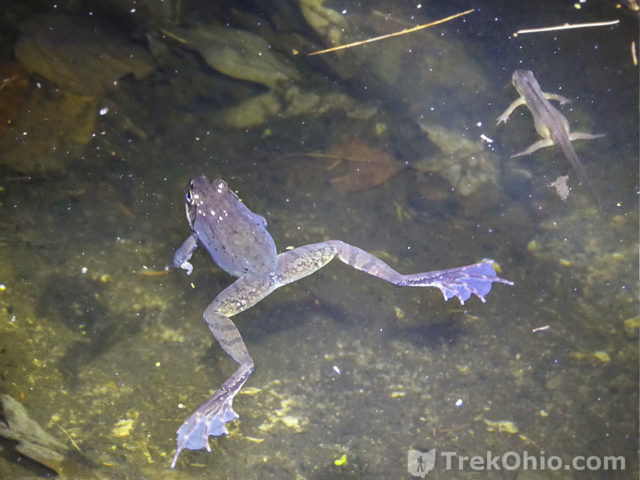 Below is a photo of a newt along side a frog; it was taken at the same evening event at Wahkeena. I want to thank the staff at Wahkeena for holding this event. Naturalists at other parks throughout the state hold similar such events. 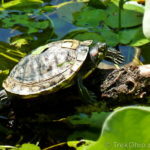 TrekOhio: Wahkeena Nature Preserve — Our overview of the nature preserves, including links to their blog, and descriptions of the area by other, official sites. Wikipedia: Eastern newt — The res-spotted newt is a subspecies of the eastern newt. HikersNotebook.net: Red-Spotted Newt — discusses aquatic newts reverting back to their terrestrial, red eft form in the case of severe droughts. 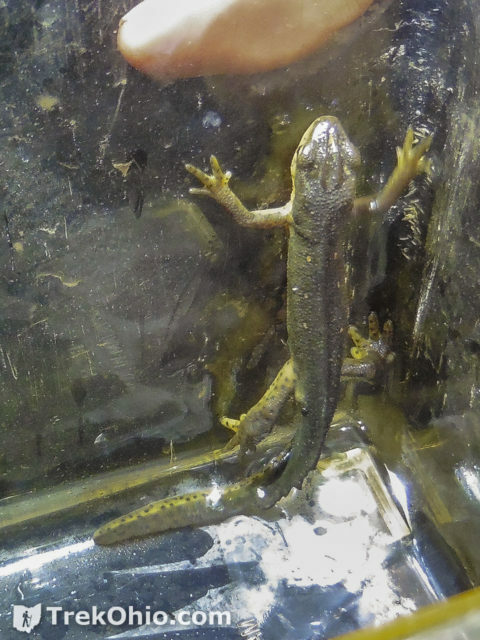 Share the post "Salamanders and newts at their breeding sites"
What an interesting post! Thanks for sharing all the information about these beautiful creatures.